We’re hearing a lot recently about how most of our jobs are going to be automated away by robots and intelligent machines, and new Universal Basic Income schemes, that aim to soften the impact, now Foxconn, the Taiwanese manufacturing giant behind Apple’s iPhone and many other major electronics devices, have announced they are going to automate away all of their human employees – all 1.2 million of them – in order to improve efficiency, safety and reduce costs. Dai Jia-peng, the general manager of Foxconn’s automation committee, says the company has a three phase plan in place to fully automate its Chinese factories using software and in house robotics units, known as Foxbots. The first phase of Foxconn’s automation plans involve replacing the work that is either dangerous or involves repetitious labor humans are unwilling to do. The second phase involves improving efficiency by streamlining production lines to reduce the number of excess robots in use, and the third and final phase involves automating entire factories, “with only a minimal number of workers assigned for production, logistics, testing, and inspection processes,” according to Jia-peng. And then one day, in the not too distant future, these workers will also be replaced, for example with machine vision systems that will be capable of carrying out the inspections, and with robo logistics systems. The slow and steady march of manufacturing automation has been in place at Foxconn for years. The company said last year that it had set a benchmark of 30 percent automation at its Chinese factories by 2020. The company now produces around 10,000 Foxbots a year all of which can be used to replace human labor, and last March the company said it had managed to automate away 60,000 jobs at just one of its factories. Over the long term, robots are cheaper than human labor but the initial investment can be expensive – it’s also complicated, expensive, and time consuming to program robots to perform multiple tasks, or to reprogram them to perform new ones and that’s one of the big reasons why thus far humans have been far more economical. To stay competitive though, Foxconn believes it has to transition to full automation, and as for the problem of re-programming robots? Well, those problems and costs are going away as robots become more adept at teaching other robots new tasks, using the equivalent of a “hive” mind. The Chinese government though could complicate Foxconn’s ambitions. They’ve incentivised and prioritised human employment in the country, and in areas like Chengdu, Shenzhen, and Zhengzhou, local governments have paid out billions of dollars in incentives, energy contracts, and public infrastructure to Foxconn to allow the company to expand. However, this too will become less of a problem as the company starts moving and expanding operations abroad to countries such as India, and now, under Trump, the US. As of last year, Foxconn employed over 1.2 million people, making it one of the world’s largest employers and more than a million of those workers live in China, often at elaborate, university like campuses that house and feed hundreds of thousands of employees. 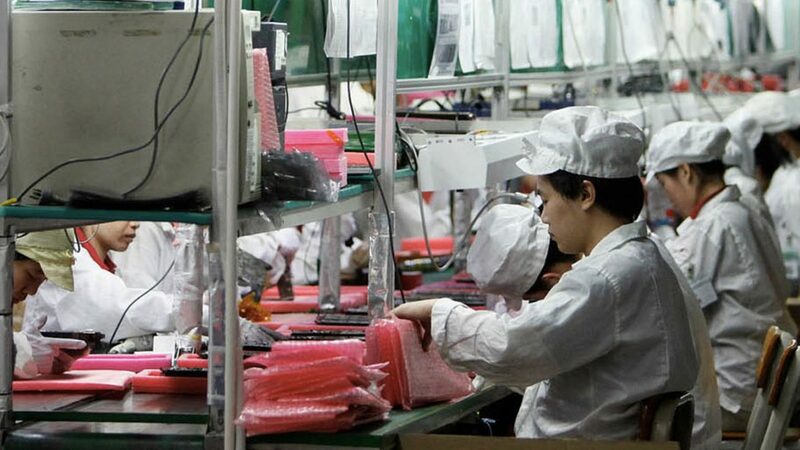 In an in-depth report published yesterday, The New York Times detailed these government incentives for Foxconn’s Zhengzhou factory, its largest and most capable plant that produces 500,000 iPhones a day and is known locally as “iPhone City.” According to Foxconn’s Jia-peng, the Zhengzhou factory has some production lines already at the second phase of automation and it’s on track to become fully automated in just a few years’ time. So it may not be long before one of China’s largest employers will be forced to grapple with its automation ambitions and the benefits it receives to transform rural parts of the country into industrial powerhouses. There is, however, a side effect to automation that would specifically benefit a company like Foxconn. The manufacturer has been plagued by its sometimes abysmal worker conditions and a high rate of employee suicide. So much so in fact that Foxconn had to install suicide netting at factories throughout China and take measures to protect itself against employee litigation. By replacing humans with robots, Foxconn would relieve itself of any issues stemming from its treatment of workers without having to actually improve living and working conditions or increase wages. But in doing so, it will ultimately end up putting hundreds of thousands, if not millions, of people out of work, and as far as we humans go, when we look at it like that it’s like curing a broken ankle by sawing off your leg. Good post Matthew. And a very timely one as this trend will only accelerate. Job dislocation and replacement will be in the news for months and years to come. It will create a tech backlash against AI if the business and technology leaders do not get ahead of it, collaborate and realize the “new collar” jobs that AI can create by pairing humans and machine. I suggest looking into architectures that are human-centered, in fact, ‘associate systems’ are the most powerful kind. Autonomous learning systems are not good for humanity, explicit/declarative models are in fact the strategic move for long term. Matthew Griffin … unless hybrid models are legislated, they will not happen at scale … less cost efficient. The interesting corollary is that this trend will force us to actively think and achieve a post-captalist model … automation canibalizes capitalism. The danger is, as it is emerging with Trump, Brexit etc., is that this post-capitalism could easily look like Germany in the 1930s. Andreas Freund, PhD Your point about achieving a “post-capitalist” model is key here. Right now, the only value that is accepted is profitability within the frame of reference of the corporation. The impact on society of the decisions made within the corporation are merely “externalities”. Many economists (Nouriel Rubini, Thomas Piketty, Joseph Stiglitz, etc. etc.) are sounding the warning that the “financialization” of the economy and the plunge towards automation and AI are not sustainable from a social perspective. In the end, capitalism will eat itself. The only question is whether we will manage its devolution or be devoured as collateral damage. i am not sure who companies will survive if no one is left to buy their goods. no more people displaced the less people to buy the goods made. this is not a good thing. Hey Kevin, I’m starting to wonder if the Mormons have the right societal approach…! it is a bad decision by foxconn. their manufacturing costs will drop at first… then slowly increase over time. it takes 5 human engineers to keep each machine-type/robot-type alive. Hey Will, now that would be an interesting case study… do you have any info you can share? Ultimately any company will be a DAO … fully automated and run by AI as its stakeholders. The impact goes beyond just labor replacement through deployment of robots and automation. We have some major shifts happening in cognitive processing abilities that are being impacted by a growing reliance on AI technology and personal digital assistants. These technologies are incredibly valuable and useful in helping us make better more informed decisions, unfortunately because of human nature and brain elasticity it can also cause us to lose our ability to focus on longer duration cognitive tasks, such as those that require learned expertise. Consider the trends with driving cars (quickly becoming a lost skill), reading novels (too boring and slow), or apprenticeships in trades (notice how fewer new plumbers, electricians and other skilled trades are entering the workforce). All I’m saying is we need to consider the impact of technology advances to traditional societal systems like education and job structure so we can prepare people to be a productive and contributing part of society in the future. Right now our strategy is to tell them that their old jobs will be legislated back, though all know that is a lie, as it is not sustainable. And we do not teach our children the required skills to survive the transition period. Great post. Automation will change our lives and even the political paradigm. There is a December White House report on AI worth reading. The gist of it is that government must come up with ways to provide a safety net for displaced and redundant labor. The best for the labors would be to adopted by the new technology, each company should update to the A.I. but has to keep in mind of her labors. After all the labors have do their part in the past for this future. Hey Marinos true, unfortunately I’m not think many companies think that holistically about their workers (some do to be fair), perhaps this is when we began a societal shift of all being more caring and sharing? Hey Colin, thanks for the links!